US President Donald Trump’s incessant complaints about sharing the burden of defence spending between NATO allies would be the main worry on many European leaders’ minds as they meet over the next two days in Brussels. Yet these leaders would wish to achieve more than burden sharing – a long-running concern for the US – in an unpredictable and changing world, especially regarding security threats from a revisionist Russia, and terrorism. Trump has repeatedly expressed his apprehension about lower military spending by NATO partners and suggested that European allies take the US security umbrella for granted. NATO’s collective security and deterrence, which considers an attack on one member as an attack on all warranting a collective response by the alliance, is the framework in which the US provides security assurance to NATO allies. Trump has shown a great degree of unease with the US shouldering a larger proportion of security burden in the alliance compared to European countries. He wants NATO’s European members to increase military spending to the target of 2% of gross domestic product (GDP) agreed to at the 2014 NATO summit. Since the turn of the century, military expenditure for NATO countries has constantly stayed well below 2% of GDP, compared to more than 3% in the US. 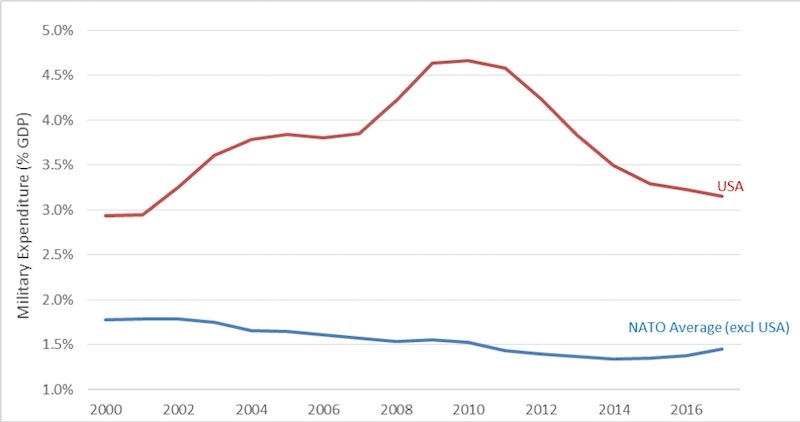 Trends in military expenditure for NATO allies and the US are illustrated in the following graph (data is sourced from Stockholm International Peace Research Institute). That European nations need the US security guarantee now more than at any time since the Cold War might make them more willing to meet US demands. European nations have actually increased their military expenditure in the past three years, following historic low spending in the aftermath of the global financial crisis that led to austerity and a sovereign debt crisis in Europe. In recent years, European nations have experienced increasing threat from a more aggressive Russia. The Novichok nerve agent attack in the UK on former Russian spy Sergei Skripal and his daughter Yulia, and subsequent poisoning of a couple this month, is only the latest example of Russian belligerence. The Russian annexation of Crimea, invasion of eastern Ukraine, support of the Assad regime in Syria, and downing of a Malaysian aircraft over Ukraine shows a broader pattern. In addition, allegations are directed at Russia for manipulating elections in the US and France, as well as distorting Brexit and Catalonian referendums in Britain and Spain. Europe has also experienced a surge in terrorist activities in recent years, reaching 205 attacks in 2017 – the second highest number of incidents after 2014, during which 226 terrorist attacks took place Europe-wide. While a smaller proportion of the attacks were undertaken by Islamist terrorists, the resulting number of casualties was higher. Across Europe in 2017, victims of terrorist attacks totalled more than 900, including 68 dead and 844 injured. This is compared with 116 victims of Islamist-inspired terrorism in the US since 2001. The threat of an increasingly aggressive Russia and transnational terrorism should therefore define the future direction of NATO and its strategic focus. However, the risk of a confrontation between NATO’s European allies and the US over burden sharing could well direct attention away from important issues facing the transatlantic alliance towards the theatrical manoeuvres of the US President.